In 2012, discount retailer Target caused a minor controversy by sending maternity coupons to a pregnant teenager who had not yet disclosed this fact. What really happens when you scan your loyalty card at a retailer, when you type something into your browser’s search bar, or when you “like” something on Facebook? 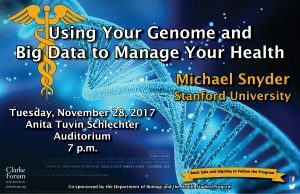 Everything that exists can be measured, from whole-genome sequences to consumer behavior. 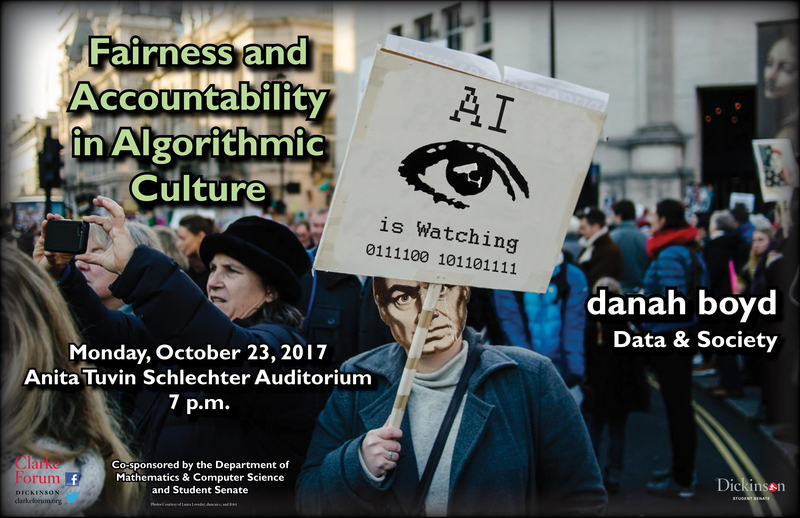 We are, as novelist Don DeLillo put it thirty years ago, “the sum total of our data.” Our fall 2017 theme will explore questions such as: Who is collecting this data? What are they doing with it? What implications does this have for privacy and individual liberty? 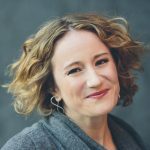 Can Big Data transcend the biases and prejudices inherent in human decision making, or merely provide a quantitative justification for the reinforcement of systemic inequalities? 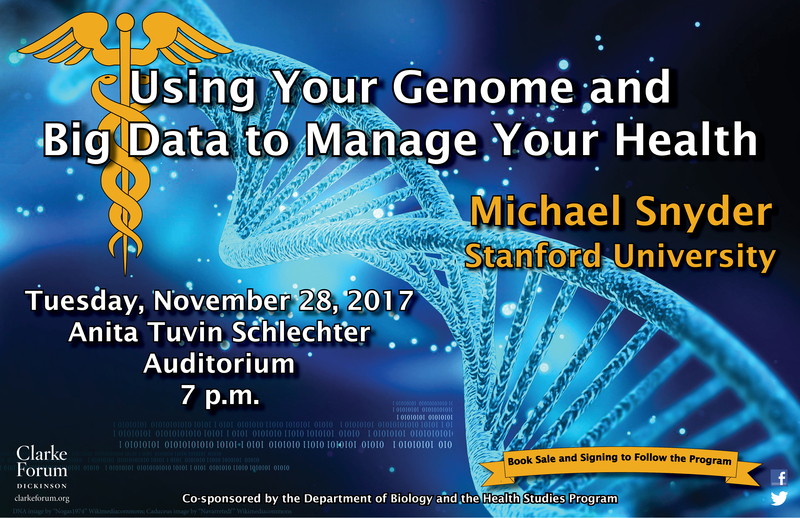 Included will be topics such as privacy and social media; genomics and personalized medicine; climate and economic modeling; the spread of viral and fake news; and the psychological aspects of data-driven decision making. 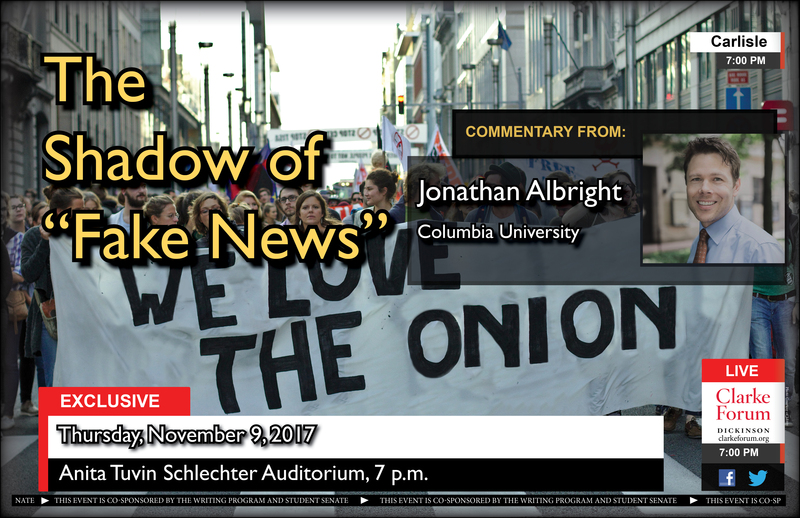 Albright will explore the emerging arms race in how “fake news” is being used to target and track individuals and the implications this has for media, the tech industries, and democracy itself. This event is sponsored by the Clarke Forum for Contemporary Issues and co-sponsored by the Writing Program and Student Senate. It is also part of the Clarke Forum’s semester theme, Big Data. 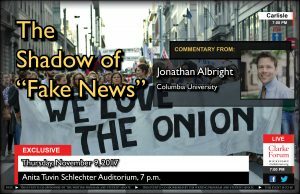 Jonathan Albright is the research director at Columbia University’s Tow Center for Digital Journalism and a faculty associate at the Berkman Klein Center for Internet and Society at Harvard University. 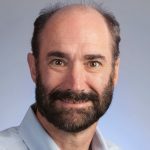 His work focuses on the analysis of socially-mediated news events, misinformation/propaganda, and trending topics, applying an exploratory, mixed-methods, and data-driven approach. 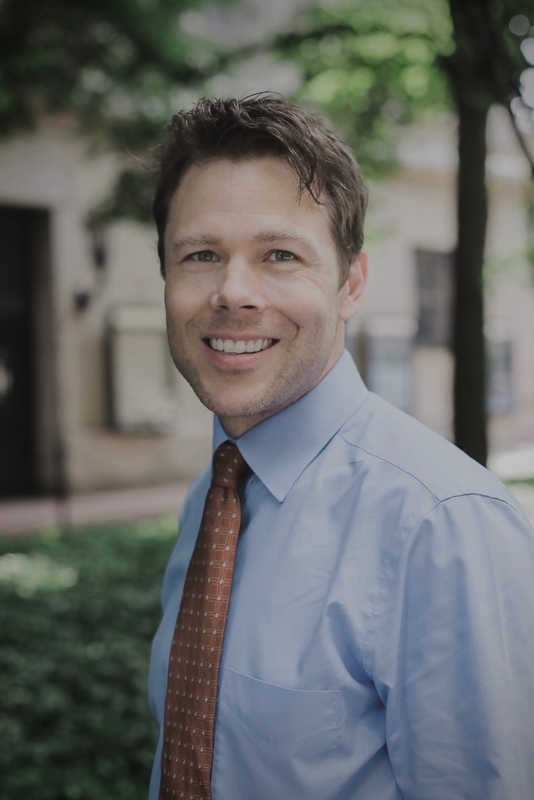 He is a co-author of the Pew Internet report, “The Future of Free Speech, Trolls, Anonymity and Fake News Online.” Albright’s work uncovering and mapping the news ecosystem has been featured in The Washington Post, The Guardian, Fortune, and cited in The New Yorker, AP Technology, BuzzFeed, Fox Business, Quartz, and the BBC. He holds an M.S. from the University of Oregon’s School of Journalism and Communication, and a Ph.D from The University of Auckland. He is an alumnus of the Oxford Internet Institute’s Summer Doctoral Programme, a past participant at the University of Amsterdam’s Digital Methods Initiative, and has worked for Yahoo, Google, and McClatchy. 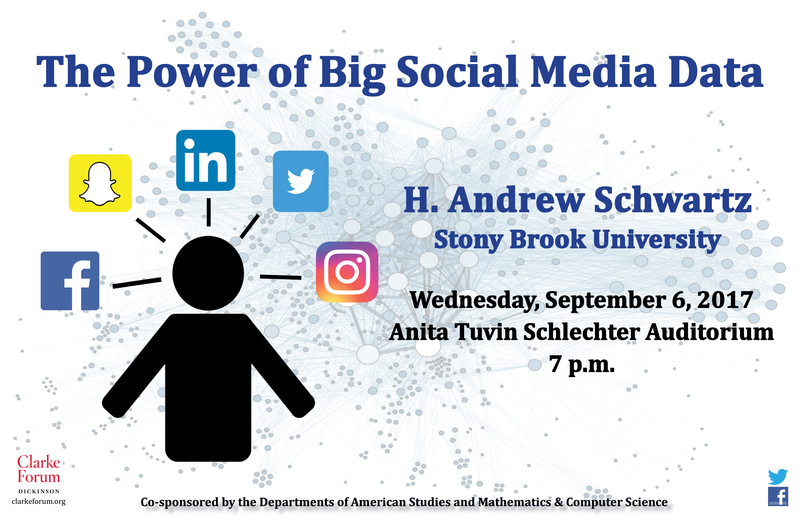 Schwartz will focus on what large-scale social media data can reveal about the users generating it and how this is changing social science. 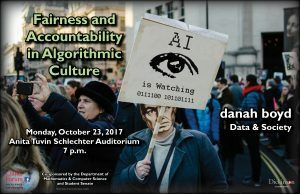 The event is sponsored by the Clarke Forum for Contemporary Issues and co-sponsored by the Department of Mathematics & Computer Science and the Department of American Studies. It is also part of the Clarke Forum’s semester theme, Big Data. H. Andrew Schwartz is an assistant professor of computer science at Stony Brook University (SUNY), where he runs the HLAB: Human Language Analysis Beings, and teaches courses in data science. 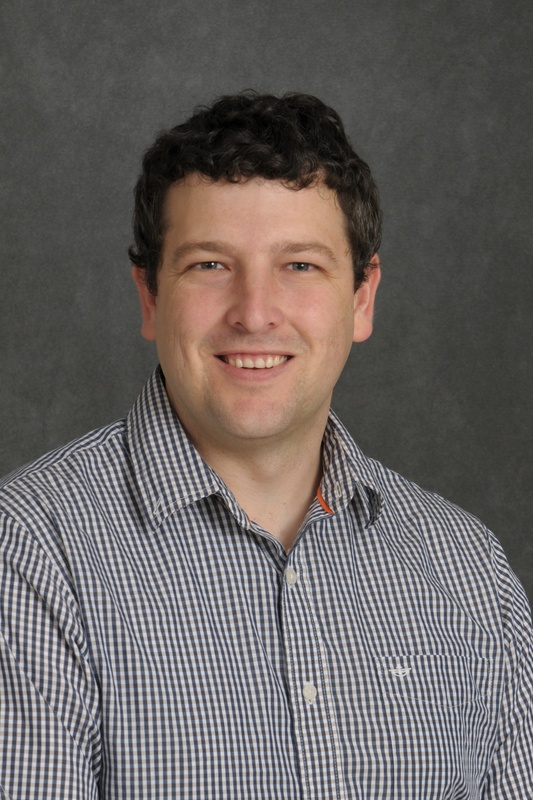 His interdisciplinary research focuses on large and scalable language analyses for health and social sciences. 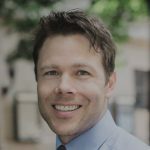 Utilizing natural language processing and machine learning techniques he seeks to discover new behavioral and psychological factors of health and well-being as manifest through language in social media. 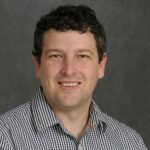 He received his Ph.D. in computer science from the University of Central Florida in 2011 with research on acquiring lexical semantic knowledge from the Web, and he was previously a visiting assistant professor at the University of Pennsylvania and lead research scientist for the World Well-Being Project, a multi-disciplinary team of computer, health, and social scientists seeking to measure and advance our understanding of human well-being using big data. His work has been featured in The New York Times, Wired, and The Washington Post.